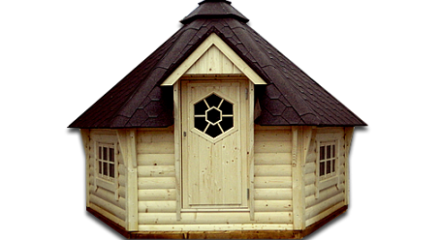 The Kota Grill House is made from the highest quality Scandinavian Pine (10 x denser than American pine) with 1.5 in. thick tongue and groove walls, double-pane windows, and a roof covered with 15-year professional shingles. It’s octagon shape is a fun addition to any backyard and large enough to fit 9 adults.